Losing weight can be a simple task, basically, it consists in eating properly. But achieving this can be complicated, especially with so many temptations that pushes us to overeat. In particular, those toxic foods that don’t help us reach an appropriate weight. Each person can find different tools that help them reach their purpose, some increase their physical activity, others try intermittent fasting, while others go for the green liquids in the morning, etc. Today I want to tell you about a tool that has been shown in many scientific studies that can double or triple the weight loss. This is…. THE FOOD DIARY! Recording what you eat every day creates a powerful effect on your subconscious, that helps you evaluate yourself and analyze what you’re doing with your diet. According to a study conducted with 1700 patients by the Kaiser Permanente's Center for Health Research in Portland, people who record what they eat each day lost two times more weight than those who didn’t record it. Getting better results than those who tried weight-loss pills, without side effects and at a lower cost! You only need a couple of minutes a day to record what you eat and notice how you are nurturing your body. It consists of recording in a notebook everything you ate throughout the day, indicating the quantities of each food. With the arrival of smartphones, the food diary has evolved and you can take it everywhere, without having to carry a notebook, you can fill it while waiting in line, or taking a moment before bedtime. In 2014 the University of Arizona did a test with 80 students. Part of them recorded everything they ate in a notebook every day, the second group logged it in a notes app on their smartphone and the third group did it in a nutrition app. After eight weeks, all the members of the group that used the nutrition app maintained their goal! The groups who used paper or an app on cell phone notes lost 20% of their members. The app did help increase the consistency of the people who used it. Using a specialized app as a food diary can give you many advantages and make everything easier. Some apps, allow you to keep track of your food intake, track your measurements, show you in which nutritional group belongs each food and the number of servings that you should ideally eat to have a balanced diet. In a graph, you can see if you have reached the ideal goal of each group, or if you need to eat more. 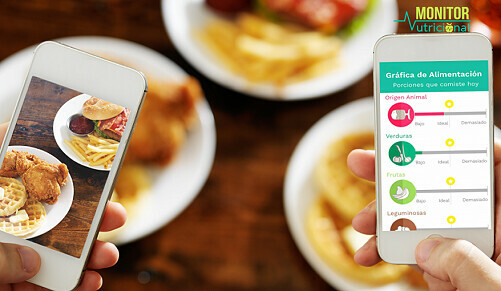 In addition, some apps give you a list of suggested foods to complete your servings of vegetables, fruits, meats, etc. And can send a complete analysis of your diet to your nutritionist so you can monitor and give yourself a more adequate diet. So… if you are determined to control your weight and be healthier, a food diary is a safe and simple option to achieve it. Start now! There’s a great app for Spanish speakers where they can keep their nutriólogo handy. You don’t have to say goodbye to tacos and enchiladas in your pursuit of keeping a healthy weight, you just need to learn to keep a balance.